The Balin is a modern bar stool that draws inspiration from geometry. Create a tailored, modern look in your kitchen or counter dining area with the sleek form and unparalleled style of these brushed stainless steel and black bar stools. The legs and frame lend these handsome stools added strength ensuring years of everyday use. The padded cushioned seat and back will provide optimal comfort for you and your guests. Upholstered in a durable black material that offers the look of leather that is stain resistant, fade resistant and easy to care for. Pair this modern bar stool with your new granite breakfast bar or your remodeled kitchen space. 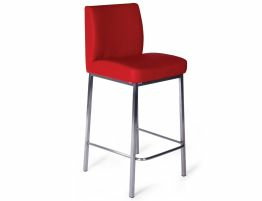 Our Balin designer bar stool has a sturdy steel and comfortably padded seat. Compared with cheap, flimsy light weight chrome counterparts, the stainless steel construction lends the Balin an expensive and well crafted feel. 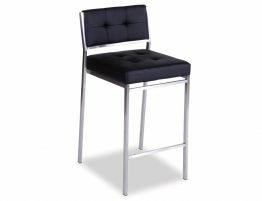 Finished in black with tufting on both the seat and back adds an attractive design detail to this already eye catching bar stool. Non-marking feet offer additional protection for your flooring. The supple, black material is impeccably stitched, tufted and is easy to care for. The material wipes clean, and stands up to regular use making the Balin modern Bar stool perfectly suited for high traffic kitchens or busy restaurants. 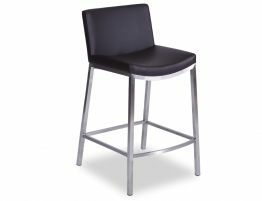 The streamlined design, gleaming stainless steel frame and rich black upholstery on these bar and counter stools looks tailored and sophisticated. The sleek, jet black upholstery over a plush, cushioned seat and back lend softness to this rather stark, geometric bar stool. The chic black leather-like upholstery would be a great fit with monochromatic, black and white design and bright modern colour trends. Pair this design staple with bright clarets, sunny yellows, muted greys or other trendy design palettes. The comfortably padded seat and back are upholstered in a leather like material that that feels great and is easy to clean. 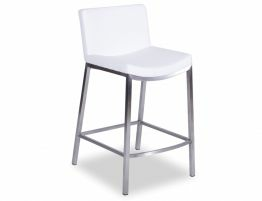 Our breakfast bar stool offers a modern design that works great in modern spaces and even transitional spaces. 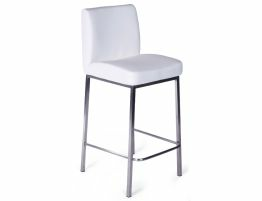 This contemporary four post bar stool is nice to look at and built to last.